LED battery level indicator lets you know exactly how much power you have. This case more than doubles your iPhone's battery life without doubling its size. The concern of cell phone is running out of juice will not be occurred when outside. Simultaneously charge your iPhone and battery case together with the lightning cable. Pocket-size design let you get rid of the situation that power bank with high capacity but too heavy to carry ,with small capacity but cannot meet the demand of cell phone. 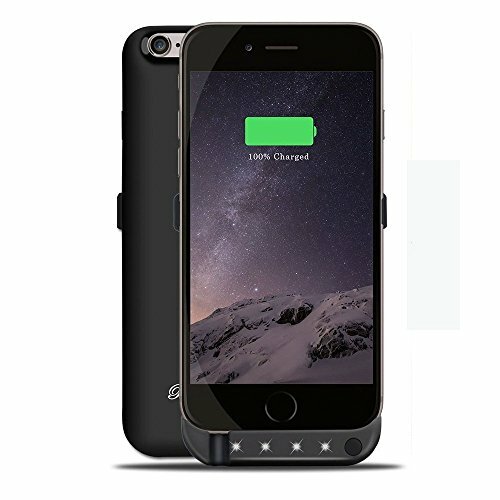 Put your phone on the battery case and no more action is needed even in the case of charging. 100%+ Longer Battery Life - Powerful 3000mAh Li-polymer rechargeable battery can effectively provide 100%+ extra battery life to your iPhone 6/6S, which is equivalent to add 60 hrs music banquet,18 hrs talk time and 11 hrs video play time. Get ready for hours of non-stop fun. Amazing Recharge Rate - Full charge your iPhone only takes 2.5-3 hrs, the same time needed to full charge the battery case with the lightning cable. No more long waiting for fun. Ultra-portable Design - 2.96oz weight gets you rid of tiredness from your hand while using. Incredibly slim 0.24inch thickness provides comfortable grip. Lightweight and small enough to fit in your hands or put it into your pocket. Safety Proof - Double battery management chips insure high conversion rate, avoiding over charge or over discharge. Anti-heat, intelligent power-off. Tested to be compatible with IOS 8/9/10 and following updates. Reliable Quality - Every item would be strictly tested before shipping out to make sure the user experience. A replacement would be sent if you receive the defective products within 12 months. If you have any questions about this product by BoxLegend, contact us by completing and submitting the form below. If you are looking for a specif part number, please include it with your message.